We did indeed drive to Washington for the Reason Rally, and I think it worked out pretty well. I wish the weather had been better – we wound up leaving before PZ, Randi, Dawkins, and Eddie Izzard were up because it was just too cold and miserable. But I was satisfied that I got to go and be counted among the crowd, and it was especially great to see Adam Savage, Greta Christina, and Tim Minchin. 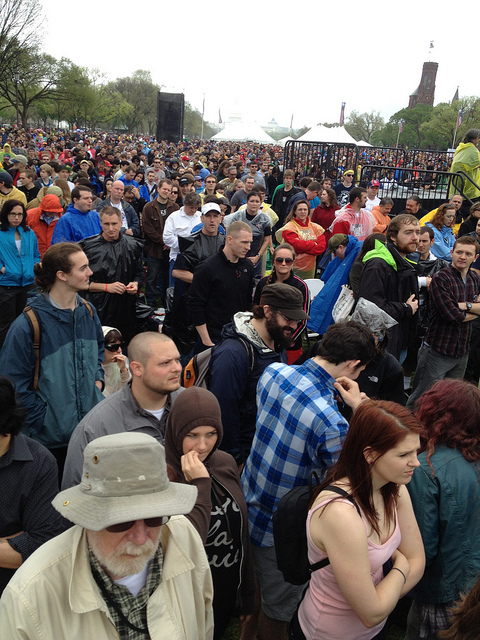 The crowd was impressive for such a rainy day. I’ve seen estimates ranging from 8,000 to 30,000, and we’ll never know for sure, since they couldn’t get a satellite image through the cloud cover, plus the length of the event (9 hours or so) and the weather meant people came and went. But it was definitely crowded, as well as diverse – families and young adults up through senior citizens, and a pretty good mix of ethnicities – which is a great improvement over the mostly-old-white-guys demographic of the Godless March a few years ago. The camera people really seemed to enjoy getting shots of little kids and grandmas while Tim Minchin was singing “The Pope Song” (comprising at least 50% foul language). Most importantly, the crowd was happy and upbeat. There were a couple of negative opinions voiced onstage (including Dawkins’ unfortunate exhortation to publicly ridicule and mock religious people, rather than frankly questioning religious ideas and institutions), and a few cranky protest signs, but the event mostly stuck to David Sliverman’s expressed purpose of “Yay us!” I was also moved by the appeals to be as out as possible. I confess, as out as I am, I tend to avoid the subject in casual conversation, even if it naturally comes up. I’m now inspired to be more open about my participation in the non-believer community even with people who don’t know me well. It would be nice to believe that I could be totally out and open, even when the time comes for me to look for employment again, but I don’t think I’m that bold yet. Tim Minchin’s performance, including Confessions, If IDidn’t Have You, Thank You God, The Pope Song, and Storm (all of which are so, so, not safe for work, in case you couldn’t guess). Posted on March 28, 2012, in Religion, Skepticism and tagged Reason Rally. Bookmark the permalink. 2 Comments. Awesome! Some of our local secular group members went – I hope to go one year and take the kiddos! I hope you are coming to Rock Beyond Belief tomorrow. Camp Quest will be there and the kids can meet Richard Dawkins. Dale McGowan will be there too. My daughter (8) and I are excited about it.